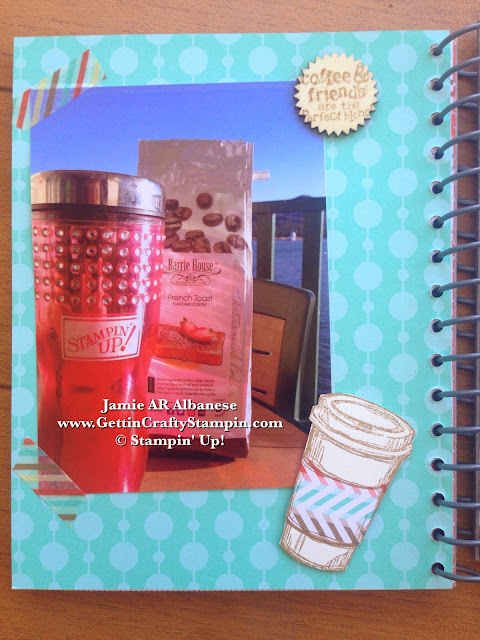 Getting Crafty with Jamie: Work Hard to Play Harder!! Work Hard to Play Harder!! If you are like me, you Work Hard to Play Harder!! Capture those moments and when you are far from a break, look back on the times you were able to renew and refresh. The new Retro Fresh This and That Journal is a wonderful way to have fun scrapbooking those memories. With coordinated Journaling Tags, Designer Stickers, Designer Washi Tape and Designer Series Paper you can take them along for quick scrapbooking that will be cherished! See the many ways that I am addicted to Celebrating our Memories and Documenting our life with our Memory Celebrating Mondays.. with few hours to spare in the day, these ways are quick, efficient and yet stylish and fun!! 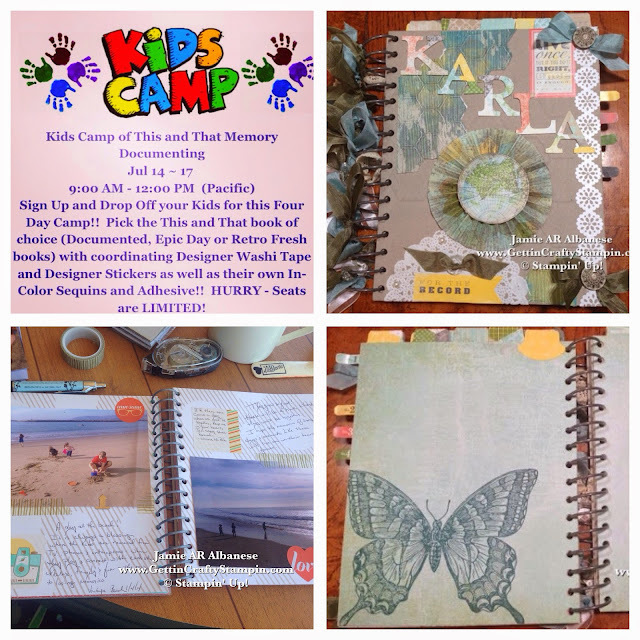 Join the Kids Camp This and That week coming up on July 14-17th! RSVP ASAP for these Four Days of FUN! Orders will be placed July 9th! I need YOUR selection to assure it's received on time!! This post was from a recent Newsletter - I just couldn't resist re-posting for the masses!! 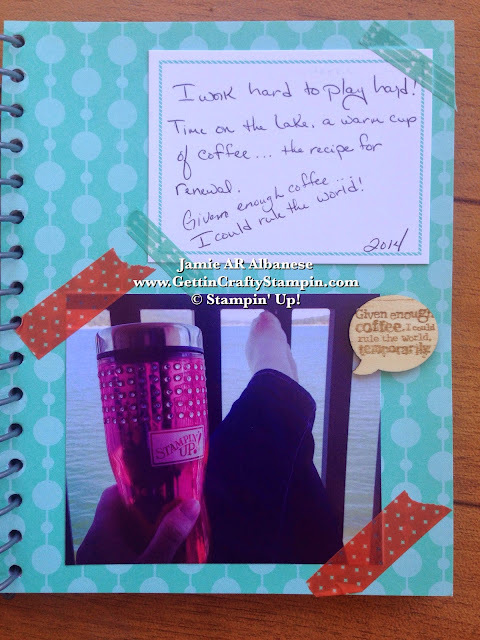 Are YOU Signed Up for the Gettin' Crafty Stampin' Newsletter? It's FREE and with Bonus Exclusive Tutorials and more... you don't want to miss out!! Print photos from your recent vacation or a favorite get-away. Here the few moments of quiet with a cup of coffee, a fun cup and the lake, feet up... sigh. 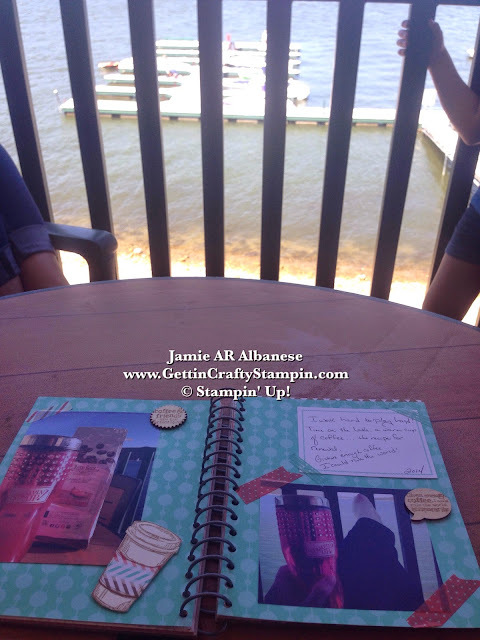 With the Groovebook app I can print and carry photos from trips that are date stamped, bound but easy to remove. 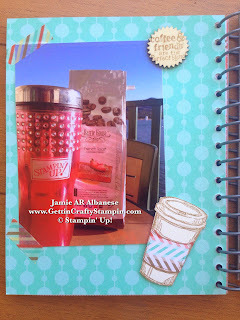 It keeps my crafting clean and organized... we print more photos that I'd use so I go through and let my kids use them in their books as they document their time with family, friends and more! Receive your first Groovebook book for FREE - as a gift from me! No obligation to buy - I do not receive ANYTHING for this - I just can't resist passing on an amazing find to you - my readers!! Adhere the photos to the Retro Fresh This and That Journal with the Retro Fresh Designer Washi Tape. 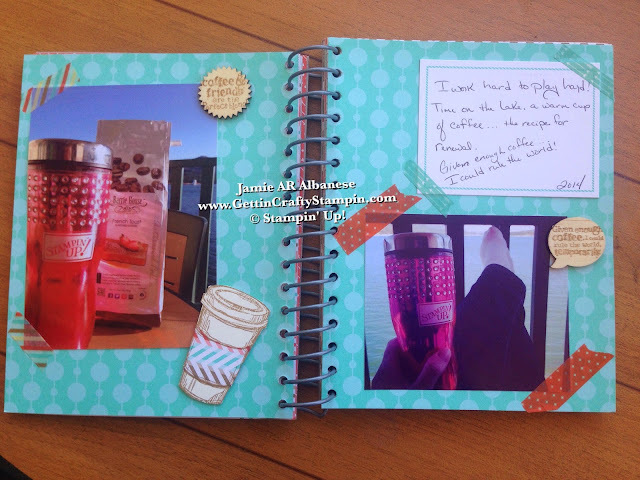 The fun and coordinated patterns allows me to add fun elements to my page. Stamp the Coffee Cup from the Perfect Blend stamp set on Very Vanilla and a then the band of the coffee cup on a piece of the Retro Fresh Designer Paper. Cut both out and adhere them together. Journal some thoughts and take a moment to capture "your" time and thoughts (not just that of your family or friends) with the Retro Fresh Designer Journaling Tags. Adhere to the page with the Retro Fresh Designer Washi Tape. You work hard... so play hard and enjoy those 'you' moments (they are too few and far in-between). When you feel the pressures of life, take a moment to reflect on your down and refreshing time.. with this Retro Fresh This and That Journal!